Poland and the Czech Republic are the latest countries to have been hit by a storm that has swept northern Europe leaving at least 43 people dead. 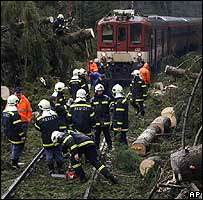 At least six people were reported killed in Poland as winds of more than 200km/h (124mph) were recorded. Germany, the UK, France, Belgium, and the Netherlands were picking themselves up on Friday after the storm passed. Some services returned to normal, but thousands of travellers were still stranded and homes left without power. Late on Friday, high winds reached Russia and Ukraine, with a pipeline carrying Russian oil to the EU via Ukraine being temporarily shut down after power was knocked out. Roads, rail lines and electricity pylons have been taken out of action across northern Europe by falling trees, collapsing walls and flying wreckage. In Germany, the 11 dead included an 18-month-old baby killed by a door that was ripped off its hinges in Munich, while a 73-year-old man died in Augsburg when a barn door fell on him. Eleven people were killed in Britain, including a two-year-old boy who was crushed by a wall, and the managing director of Birmingham Airport, whose car was hit by a tree. 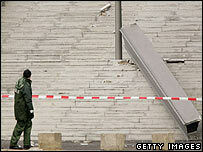 Meteorologists said the winds reached severe gale force in Britain and were the strongest there since January 1990. They hit hurricane force in Germany, the worst in nearly a decade. In the Netherlands, an 11-year-old boy was killed in the town of Riel when he was blown into a car, AFP reported. As the storm moved east, a Polish crane operator in the southern town of Katowice was reported killed when his machinery collapsed, and another died in Zaborow, near Warsaw, when the roof of his house fell in. At one point, in the Czech Republic a million people faced power cuts. A million households in Germany also suffered blackouts and tens of thousands of homes in Poland, Austria, northern France and the UK were also hit. Normal rail operations were resuming in Germany after the entire network was closed down as a precautionary measure for the first time in its history. The disruption came after Berlin's new central station, the biggest rail hub in Europe, was evacuated after the winds tore off a two-tonne steel girder, which crashed 40m (130ft) onto a stairway. Please do not endanger yourself or others, take any unnecessary risks or infringe any laws.